I have never been a great swimmer. Even the watery worlds of video games have proven unfriendly time and again. Water is notoriously hard to get right. Some developers just scratch the idea entirely, tossing out initial design plans to maintain their sanity. Altair of Assassin's Creed was hydrophobic for good reason. 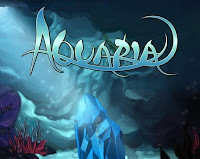 Although, thanks to the enticing and philanthropic Humble Indie Bundle, I have recently been playing Aquaria, a 2007 game by Bit Blot that reminds me that yes, games can be better, down where its wetter, under the sea. Most games that jump into the deep end handle "water levels" terribly. These "H2Onerous" arenas tend to be tedious, difficult, and confusing. I will admit I have never enjoyed the aquatic levels of any Mario game going all the way to World 2-2 of the original. When the plumber splashes down, his forward progress becomes painfully slow and awkward. From Donkey Kong Country's "coral capers" to Lara Crofts wet suit escapades, most underwater experiences have been uninspired shipwrecks. Water levels had sunk my expectations for Aquaria to Mariana Trench depths. To my delight, Bit Blot managed to actually create an entertaining sea adventure. Naija, a mermaid like creature, is the protagonist of Aquaria. Awakening from an animalistic consciousness, and seemingly the last of her kind, Naija explores the 2D ocean labyrinth of Aquaria, seeking clues to her existence in the remnants of ancient civilizations. 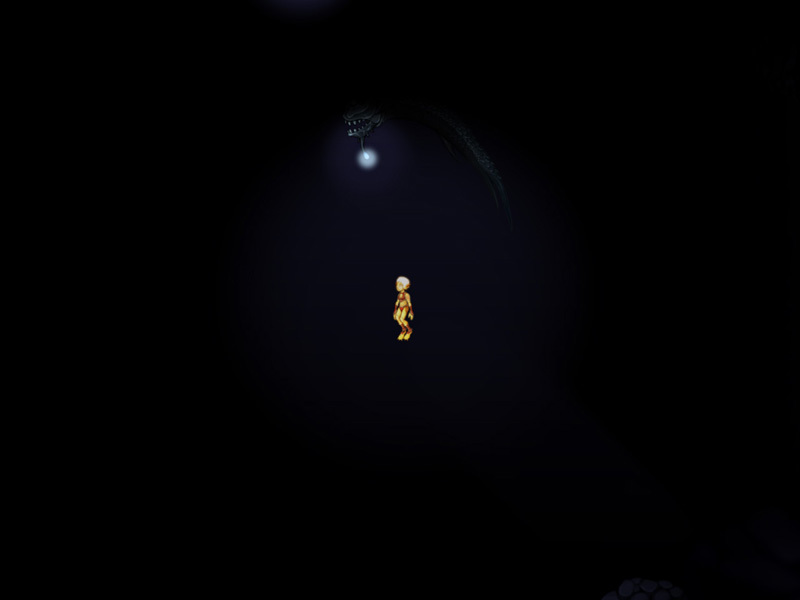 Gaining new physical forms, Naija increases her roaming grounds to shallow seas and the deep abyss. All the while, making the player feel at home in the water. The fluidity of movement plays no small part in Aquaria's success. A few exceptions withstanding, most water levels do a poor job of expressing motion through liquids. Seafaring characters tend to be sluggish and particularly floaty. Or, on the other hand, they move too quickly through the environment and eradicate the sense of liquid immersion. Aquaria creates a happy middle-ground. Najia swims effortlessly through the ocean. Yet she is noticeably slower than some local animal life, thus expressing the limitations of her humanoid form. She is still as spry as one might expect of a mermaid. 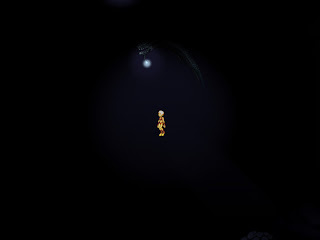 By holding the left mouse anywhere on the screen, players move Najia at various speeds depending on the proximity between the mouse icon and the character model. A quick click of the mouse and she launches ahead briefly, potentially attaching herself to rocks, granting players the ability to launch again in short succession. She also has a very sharp turning radius, letting her cut corners with ease. The resulting combat mechanic is the engaging offspring between a leopard seal and a 2D space shooter. Mobility, not direct engagement, makes up the largest portion of combat. Most enemies in Aquaria have distinct movement patterns depending on their species. Creatures with ranged attacks fire projectiles that also have their own unique flight paths. Learning how hazards move through the environment, and how to avoid them, is necessary to progress. The individual character models, many consistent with their movement, allow players to size-up an encounter at a glance. Bosses, however, tend to move less frequently, demanding fantastic player acrobatics instead. All of Najia's movements, which may change depending on her form, are called upon to engage with the world. The waters of Aquaria also manage to encourage open-world exploration while still corralling the player along an acceptable story path. Certain segments of the ocean are impassable until Najia gains a new physical form. Entrances to these areas dot the landscape, hinting at inaccessible territory while still offering bountiful opportunities for exploration. Strong currents, for example, appear throughout the environment, both helping and hindering progress. There is also a completely open but pitch black tunnel system. While exploring its depths always feels like an option, the darkness effectively cordons off the space until later in the game when Najia can create light. Thus, it always feels like players inhabit an ocean, not a relatively linear system of tubes. The dark Abyss contributes to the games ambiance as well. The environments, from an old clockwork temple to a kelp forest, are vibrant and convey some of the ocean's visual spectacle. The water surface segment is particularly entertaining. Najia can jump out of the water and onto dry land. After spending quite some time submerged, the clearly lit surface and increased gravity contrasts with the undersea world, making it seem that much more aquatic. Aquaria does suffer from some of the same faults of other maritime gaming experiences. Mainly, with its emphasis on combat and exploration through the truly vast world, Aquaria can become tedious. In short sessions however, the joy of swimming through a well realized sea of creatures is enough to tide me over between encounters. 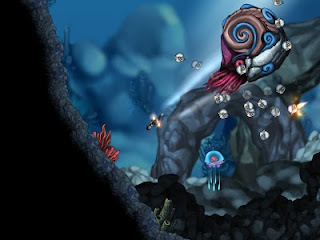 The above, coupled with several physical forms, strange nautical monstrosities, light and dark mechanics, and fluid movement, creates a highly dynamic game within its watery confinement. Three years after its release, Aquaria compels me to get my feet wet.